Many of us have old speakers that are sitting around going unused because they don’t work with wireless audio systems. However, as it turns out, those wired speakers can actually be used in the wireless world. Use wired speakers with your smartphone and Bluetooth. Use wired speakers with Chromecast for Audio and Echo Devices. Breathe new life into your wired speakers as part of an established wireless audio system. Cut down on wire clutter with traditional sources. All speakers, whether wired or wireless, need three things to work: an audio signal, power, and amplification. Amplifiers, wires, and cables supply those requirements for traditionally wired speakers. Wireless speakers plug into power, have built-in amplifiers, and instead of that old copper wire or cable, the audio signals are transmitted wirelessly to them via IR (infrared light), RF (radio frequency), Wi-Fi, or Bluetooth. Traditionally wired speakers don't have a built-in amplifier and can't receive audio signals wirelessly, but you can make them "wireless" with the use of add-on devices. 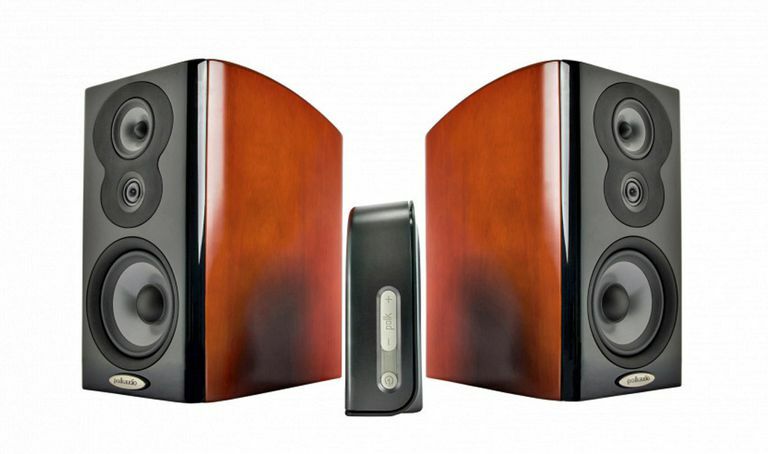 These devices serve as a bridge between the wired speakers and wireless audio signals. Let's check out some options. You can send music wirelessly to your wired speakers with the addition of Bluetooth adapters combined with an amplifier. If you have Android or iPhone, you can use it to send music to a Bluetooth receiver connected to a traditional amplifier, stereo, or home theater receiver, which, in turn, connects to your wired speakers. You can plug a TV, CD/DVD player, Audio Cassette Deck, or VCR to a Bluetooth transmitter which will send the audio signal to a Bluetooth receiver, that in turn, connects to an amplifier and your wired speakers. You may experience AV/Lip Synch issues when using Bluetooth to listen to audio from video sources (such as TV or DVD player). In place of a Bluetooth receiver connected to an external amplifier, you can use an amplifier, stereo, or home theater receiver that already has Bluetooth support built-in. This means that they can receive signals from your smartphone directly or a source connected to a Bluetooth transmitter. Connect your wired speakers to the speaker terminals provided on the Bluetooth-enabled amplifier. If you have an iPhone, in addition to Bluetooth, you can also stream music using Airplay through an Apple Airport Express to an amplifier, stereo, or home theater receiver that is connected to wired speakers. Also, select home theater receivers have Airplay support built-in. Using an audio cable, you can connect a Chromecast for Audio or Echo Dot, Echo Input, Echo Link, and Echo Plus to an amplifier, stereo, or home theater receiver that may not be equipped with internet streaming capability. Also, the Echo Link Amp can connect directly to wired speakers. This allows you to listen to music that is streamed wirelessly to the Google Chromecast for Audio via your smartphone or a Google Home using the wired speakers connected to an amplifier. With compatible Echo devices, you can stream music from your smartphone or directly from Amazon Music and other select streaming apps and also listen with your wired speakers. You can use your wired speakers with dedicated wireless audio systems, such as Sonos, Yamaha MusicCast, Denon HEOS, and DTS Play-Fi. All four platforms offer "streaming amps" that can receive audio signals wirelessly from the internet, Android and iPhones, and a home network in addition to traditional sources connected to a compatible wireless transmitter or to the amp directly. The added bonus is that they also provide connection terminals for traditionally wired speakers. These platforms enable you to mix both wireless and wired speakers in the same wireless multi-room audio system using Wi-Fi. With sources such as a TV, CD player, DVD, player, Audio Cassette Deck, VCR or compatible audio output on a stereo or home theater receiver, you can make wired speakers wireless with a wireless speaker conversion kit (also referred to as a wireless speaker kit or wireless speaker adapter). This kit includes a transmitter and receiver. You can connect the audio output of your source (TV, etc...) to audio inputs on the wireless transmitter The transmitter sends the signals wirelessly from the connected source to the wireless receiver. Here are the steps required to make your wired speakers work with a wireless speaker conversion kit. These steps apply to the sources discussed above and speakers used in Single or Mono, Stereo, Surround, or Zone 2 setups. Connect the audio output(s) of a source device to the audio inputs of the wireless transmitter. Most wireless transmitters provide RCA or 3.5mm analog audio inputs and some may provide speaker wire connections, but you may encounter one that may also provide a digital optical input. Connect the wired speakers to the wireless receiver (if amplified) with standard speaker wire. If your wireless receiver does not have a built-in amplifier, then you will need to connect the wireless receiver to an external amplifier, stereo, or home theater receiver using compatible audio connections (typically RCA analog audio connections) that in-turn will physically connect to the speakers using speaker wire. Plug the wireless transmitter and wireless receiver (and any additional amp if used) into AC power and turn them, and your audio source component on. You can now listen to music, TV, or movie sound. If you have a subwoofer in your home theater setup, you can make it wireless with a wireless speaker conversion kit that has a subwoofer input on the transmitter and subwoofer output on the wireless receiver. This is really easy to do if you have a powered subwoofer (the most common type). Powered subwoofers already have built-in amplifiers and plug into AC power. There are just two steps needed to add wireless connectivity to a subwoofer. Connect the Subwoofer output of a stereo or home theater receiver to the wireless transmitter using a short RCA cable. Connect a short RCA cable from the wireless receiver to the subwoofer's RCA stereo or LFE inputs. If you have a passive subwoofer that you wish to make wireless, you will have to place an external amplifier between the wireless receiver and the subwoofer unless the wireless receiver has a built-in amplifier with sufficient power output for the subwoofer. Adding your old wired speakers into a wireless setup provides some great benefits. However, regardless of the wireless audio source, signal transmission and reception method used, you will still have to make a physical cable or wire connection to your speakers to make them work. You also need to provide power to your sources and wireless-to-wired conversion devices. Wireless speaker kits and related products are made by several manufacturers and available at stores such as Best Buy and Fry's Electronics as well as online via Amazon. Costs vary depending on the brand and model of transmitter and receiver are packaged together as a kit, or sold separately, and whether you also need to purchase an additional amplifier to complete your setup.